The best swimsuits for various aquatic fitness activities like rigorous exercise and training routines, lap swimming, and water aerobics provide comfort, support, and performance. Chlorine resistance makes active swimandsweat suits last longer, so they’re ideal for frequent use. Let your workout types and body issues guide your bathing suit selection. Exercise and training bathing suits for serious and competitive swimmers should be one-piece silhouettes. Rigorous activities demand full-coverage plus-size swimwear, such as a high neck one piece. They deliver extra coverage from your neck to your mid-thigh and stay in place. Look for racerbacks that prevent strap slippage and twisting, facilitating easy and continuous shoulder movements. A snug fit is better than a tight one that might cut off your circulation or cause pain. Competitive bathing suit designs, materials, and purposes differ from fashion options. Ideal prospects are form-fitting with racerbacks and enough torso length to ensure complete coverage, optimal comfort, and streamlined shapes. Pick styles with tummy-control liners to create long sleek lines that smooth your body, decrease drag, and improve water flow. Stretchy fabrics also will maximize your swimming speed. Swimwear manufacturers treat these high-quality materials for chlorine resistance to extend their lives greatly. For noncompetitive water workouts like swimming laps, streamlined one-piece bathing suits don’t create excessive drag that limits your momentum. You also need secure and comfortable straps because you’ll be repeating arm movements. Check out our sporty plus-size bathing suits that fulfill both goals. Choose from active, crossover, fit, keyhole, power, and racerbacks for the utmost range of shoulder motion and dependable support. Thicker stay-put straps make arm strokes easier. Avoid thin straps that might slip off your shoulders or dig into your skin, which could slow your speed. 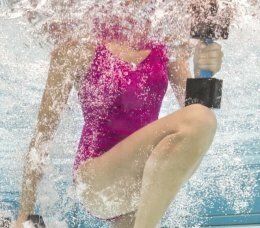 Bathing suits that combine comfort with performance are your best bets for aquatic fitness classes like water aerobics. Search for one-piece styles offering adequate coverage with scoop backs and wide supportive straps that enable and ease arm movements. When you have a full figure, your bust needs extra support while twisting and jumping in pool exercise programs. So try a one-piece plus-size swimsuit with soft bra cups. If you suffer from conditions like arthritis that limit your range of motion, two-piece tankinis are easy to put on and take off. Because they’re less restrictive than one-piece swimsuits, they also may increase your comfort in the pool. Torso length: Run a tape measure from your shoulder’s highest point between your legs and then back up the other side to the tape’s original tip. Bust: Place the tape measure over your chest’s fullest part, wrapping it around your back and shoulder blades. Waist: Measure your torso’s narrowest part. Hips: Keeping the tape measure parallel to the floor, wrap it around your hips’ fullest area. Below Swimandsweat's style descriptions, click on size chart in the Details section for clothing size comparisons or measurements by brand and size. Many also list sizing tips like fits true to size or order one or two sizes larger. Full bust:To raise your ample breasts, go for one-piece swimsuits with bra cups. Adjustable straps can hike up your voluptuous chest. For a little lifting action, pick stylish twist fronts. High, raised scoop, and square necklines provide enough extra coverage to contain your generous bust. Skip revealing V-necks to avoid accidental and embarrassing spillovers. Pear shaped: One-piece and tankini bathing suits with upper areas in lighter shades or patterns and solid-colored dark bottoms minimize heavy hips and thick thighs. Conspicuous tops make plainer lower regions less noticeable. Apple shaped: Dark solid-colored sides with print center inserts will shrink your waist. Try shirring and power mesh or tummy control panels to trim your full midriff. V-necks and twist fronts will draw attention to your bust and away from your belly.